Joining the Sunborne Val'kyr (a pet inspired by an idea from a player of the same name), another tribute NPC was discovered. Amalia and her team of corgis is a nod to @gloriaboboria, who is a big lover of corgis. There are also three new pet toys: Flaming Hoop, Leather Pet Bed, and Leather Pet Leash. Another pet was added to the long list of possible pets coming in Legion. The newest addition, Zoom (pictured right), is a snail proudly carrying a checkered flag. 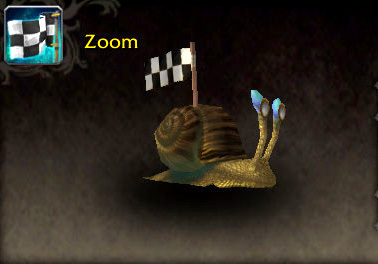 It's unknown where this pet will come from, but if the flag is any indication, we may see a snail race in the future! Along with this new pet, a new model for a baby falcosauros was datamined. The falcosauros pet comes in four different colors, and has four larger counterparts in the form of mounts — Predatory Bloodgazer, Viridian Sharptalon, Brilliant Direbeak, and Snowfeather Hunter. Upgrading to Epic Pets In Legion? Pet collectors and battlers are no strangers to epic quality pets. These pets are normally found as NPCs and in Trainer battles. However, Legion might bring an end to that exclusivity, allowing players to upgrade their companions to epic quality. The latest Alpha patch included Immaculate Battlestones, both a general version and family-specific ones. Using one of these on a battle pet will consume the stone and upgrade the pet to epic (purple) quality. Epic battlestones and pets are still undergoing testing; there is no guarantee that players will have access to them in Legion. Developers are keeping an eye on any constructive feedback regarding this change. Currently, Immaculate Battlestones can be obtained from a Deluxe Mystery Bag, which is sold by a new vendor in Breanni's shop in Dalaran, Draemus. This NPC also sells the Fel Piglet, Nightwatch Swooper, and Plump Jelly. The price for a Mystery Bag is 200 Pet Charms, but this could change during the testing phase. Opening the bag will yield at least one random family-specific battlestone. It can be used on any appropriate pet of any quality and level. Upgrading a pet to epic will increase its health, power and speed stats, but this is subject to change, depending on the effect that this will have on Pet Battles. In response to concerns revolving around the introduction of epic pets to player collections, developer Jeremy Feasel notes that it might be possible for 'epic quality' to have a cosmetic-only effect on pets. More Pet Battle chat. Cosmetic epics (adds purple, maybe some glowy fx) is prob. do-able. For those at "almost all rare," still feel bad? Additional testing and feedback is required before any official announcement is made regarding epic pets. We'll have more information and updates as it becomes available. I see I was beaten to the post by Darolyn. Kind of sad they are not going ahead with it. Collecting Charms gave me a reason to do pet fight but now I have no reason to collect charms any more. Quoting " The Celestial Tournament was a good example of pet battle content that rewarded a varied and filled pet stable." Just hope that does not mean they think we like a time gated content. The tournament was different but the time gating of it was not fun. They listened. They're not going forward with epic stones. This takes me back to 1998, when everyone I knew swore they'd never upgrade to DVDs after having so many VHS tapes already. So I am still fully against the epic upgrade stone! But, after reading tons of different forums about this... I do think it would be cool if they maybe have only one or two epic pets that are an actual challenge to collect. Like maybe Trunks could have been epic for WoD. But seriously no more than one or two! Too many would mess up game play for old content. I am kinda a newbie, but I am with most of the other comments. Trying to grind and get all your pets to epic and/or get 200 pet charms per stones would send me over the edge! However, I am in favor of some upgrades and new challenges and making some of the newer pets epic would be cool. If its an extra 0 in the price then its not bad. 20 charms per epic pet and I could get behind that. Then getting a 700+ pet collection to epic would be feasable. 200 charms per stone though is stupid. That would require 140k+ charms to get a huge collection to epic and thats just plain impossible to get. Cmon blizzard, be reasonable. I used to think epic pets was cool, but as another poster said, its too late now. Epic pets would make previous tamers trivial, and throw a huge monkey wrench into pet pvp. They'd have to retool stats so much it might just end up back where it is. Rare is good enough. We need more content otherwise. A way to make wild battles and low level tamers much more relevant. If they made it so that only 12 of your pets could be "epic" at a time, and allowed you to change which ones were epic with no penalty, I could get behind the idea. Otherwise, there is no way in hell I'm grinding all my pets to epic. Forget it. Eek! And I thought I'm set with my 4k-something pet charms. That's only 20 epic battlestones, which doesn't even make a dent in my 700+ collection! I suppose it's something that we can work on if we've done everything else, but it hurts just thinking of the grind! I think it's too late for epics. They should have been in from the start or at least come in when they were datamined in 5.2. I'm close to having all my pets to 25 and rare so I know how the completed collection players must feel. The dread of having to do the grind all over again. We need more pet content but not another quality upgrade and not more levels. More trainers, another Celestial Tournament type event, more variety in pets. I don't want to stay with the stones only. As it was said many times before, it's horrible for people with big roster. I'd rather see a way to upgrade all your roster and keep the stones for pets gathered after that. This would be also in line with the incoming Artifact project – you still need to get new equipment, but the power of your weapon (think: your current collection) is guaranteed. Of course you still need to earn that just like you earn your Artifact in a quest chain. I like the idea of rare battle pets. For those of us at the top level of collecting, or having our collection at or close to 25 across the board, it keeps the field from getting stagnant. We have to level our toons per expansion, it stands to reason we should be advancing our pet teams, beyond simply adding more to the collection. The header on this Blizzard Watch "The Queue" might be a clue to that snail race. I'm 100% Behind Epic Pets! I'm closing in on 800 pets at their maximum level and I will happily regrind everyone of them to Epic. Pet battle charms are stupidly easy to get, and you are almost promised while grinding them to get some cool stuff. I loved the idea of pet breeding to get Epics and Legendaries and that got taken away so please let this one go through. I thought epic pets were a terrible idea two years ago, and nothing has changed my mind. Especially at 200 charms per stone - what the hell? Epic pets aren't a great idea, imo. I would rather have new pet models, new pets (I demand a platypus! ), new moves, maybe even a whole new pet family? That'd be much, much better. I'm not so happy to hear about ugrading pets to Epic. I just finished spending a ton of time and Pet Charms to get my collection to 100% rare. I do not want to re-grind to go from 100% rare to 100% epic! I sure hope this does not come out in the final xpac!